Fits 96 and up Vortec V8 engines only. Will not fit non-Vortec engines. See Important Note below. This intake manifold will not work on the 87-95 TBI non-Vortec engines. This intake is to be used on the Chevy V8 Vortec engines that were used in the pickup trucks, and suv's built after 96. Regardless of the year model, the engine must have genuine Vortec cylinder heads. You may have an earlier model built before 96 and install Vortec heads on the engine and then this intake will work. This intake must also use a square bore style carburetor, such as a Holley or similar carb. This intake will not accept a GM Quadrajet carb due to the large size secondary throttle plates. The square bore carbs have the same size front and rear throttle plates. This new manifold is a special version of the PC-2020/PC-2021. While it is the exact same height, it features an open area under the plenum chamber. This provides for a flow of cooling air which keeps the temperature of the air/fuel charge lower, thus producing more power and torque. The interior plenum and port design are identical to the PC-2020/PC-2021 and will provide somewhat better overall power than the PC-2020/PC-2021 due to the special design. It is a non-EGR equipped, 180° dual plane high rise intake manifold and is an outstanding high performance street manifold that produces more power and torque from 1500 to 6500 RPM than similar competitive manifolds yet sells for a lot less money. - Intake Port Size 2.09" x 1.25"
- Recommended Intake Gasket Fel-Pro 1205/1255 or 1206/1266 depending on heads your running. The light weight aluminum reduces front end weight over stock cast iron models. Heat dissipation is another plus of aluminum over cast iron. Engines run better if the intake can rid itself of heat. 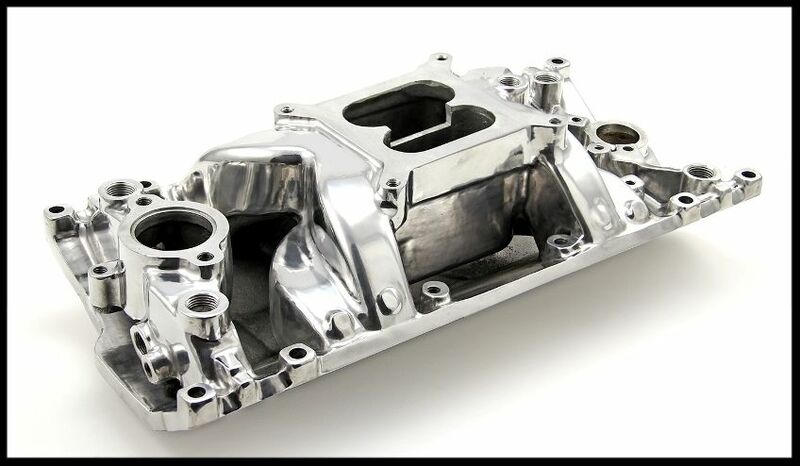 Our aluminum intakes are cast from steel molds, not sand molds. They provide a tighter grain casting, therefore reducing the occurrence of porosity which can mar the finish. No drawback to using this intake. Only a great savings in money! We offer a full line of the Speedmaster and Edelbrock intake manifolds. Be sure of what style manifold you need before purchasing. For installation tips, we suggest that you check the technical section of the various car forums. YouTube is also a great source for detailed installation instructions. As mentioned, we have a full line of Edelbrock manifolds in our other listings. It is our opinion that the Edelbrock manifolds are superior in quality, appearance, and performance. They are slightly higher in cost, but well worth the investment. They are also made in the USA.